Frame should be boxed at least 4" on either side of the front frame bracket mounting area. A Center of lower bolt hole on front bracket is located 8-1/4" forward from the center of the lower fender mounting hole. Frame bracket is positioned on inside of boxed frame rail flush with the bottom with the ears facing up. Frame brackets may need slight trimming to fit flush. B Rear axis brackets are located 36" apart measured from center to center at the coil-over mounting holes. 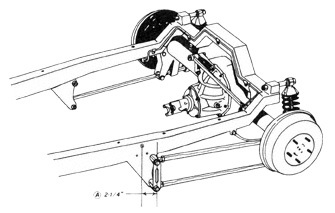 Make sure that both brackets are the same distance from the and of the axle housing. Position the front face of the axis housing parallel to the back face of the axle brackets. 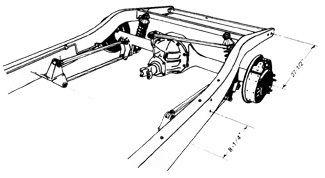 C Center of axle housing is positioned 27-1/2" forward from center of the rear spreader bar hole. Check to be sure housing is centered in wheal well before final welding. Brackets should be tack welded and the assembly should be checked for square and alignment before final welding. All welding should be performed by a qualified welder. 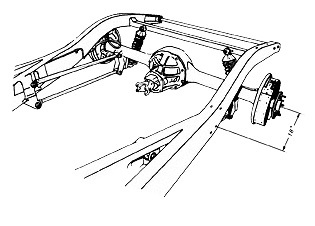 A Center of rear axis housing is located 18" back from the center of the fender mounting hole indicated. B Rear axis brackets are located 37" apart measured from center to center at the coil-over mounting holes. Make sure that both brackets are the same distance from the end of the axle housing. Set pinion angle before welding brackets to housing. Brackets should be mounted parallel to the upper shock mount to eliminate bind on shocks. C Frame brackets slip into x-member. Install bars to properly position the frame brackets at the correct angle. Brackets may require minor trimming for correct fit.